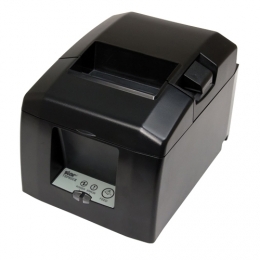 The Star TSP650II is a powerful thermal receipt printer for those who are entering into the market. It offers top value for the money, as well as a comprehensive scope of delivery, which predestine it for a variety of applications in POS and production. With up to 300 mm/second it creates 58 or 80 mm wide receipts and slips at 8 dots/mm 203 dpi. Paper roll changes take only seconds to complete and the printers vertical placement supports its high handling ergonomics. The auto-logo function ensures for the simple configuration of up to fifteen various coupons and graphics, without having to adjust the POS software. As needed, the TSP654II is available without interfaces or with pre-installed interfaces for the following connection types - LAN/Ethernet, USB, parallel, serial, HI-X Connect CloudPRNT and Wi-Fi-ready. With the optional HI-X CloudPRNT Connect port you turn the TSP650II into a fully-fledged cloud printer in a few simple steps. As needed, you also may directly connect peripheral devices. Standard serial or parallel interfaces, as well as USB, Ethernet and Bluetooth are also available.